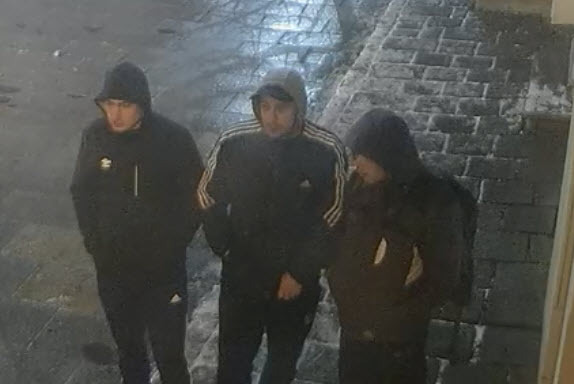 At the beginning of December, three suspects observed a man at the public transport stop Silingrovo Namesti. As a bus approached, one of them took the opportunity and stole the victim’s wallet. Photo: Police of the Czech Republic. Brno, Feb 6 (BD) – The victim noticed what happened, and ran to catch the thief. The victim slipped on the icy road, but two of his friends continued to chase the suspect. A friend of the victim managed to catch the pickpocket. “The thief, however, did not want to give up what he stole, and fought the man who had caught him. He hit his face with such force that caused him an injury for which he had to be hospitalized for several days,” said David Chaloupka, spokesman of South Moravian Police. “The thieving of the wallet has been captured by the city camera system, so we ask the public to help identify the thief and the two men who were with him before the theft. Please call the number 974 624 400, or the Police of the Czech Republic’s number: 158”, Chaloupka asked the public in an official press release today. Video by Police of the Czech Republic.